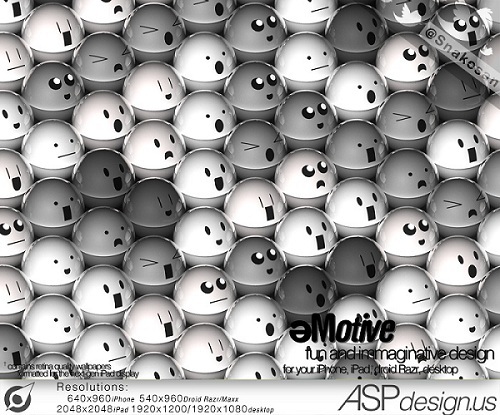 eMotive Wallpaper is an excellent quality digitally rendered simple, clean, humorous and cute Wallpaper. eMotive Wallpaper is created by asnakeproduction using Cinema 4d. It is a ZIP download, the file is 3.4 MB in size. This Article Has Been Shared 7658 Times! Pink Leaf is a minimalistic photo wallpaper for various screen resolutions. Plants Wallpaper is an excellent quality photo wallpaper of three green leafy plants on a greenish blurred background fantastic depth of field. Twilight Leaves Wallpaper is an excellent quality Photo wallpaper with fantastic post processing giving a soft hue. Cite this article as: Abhishek Ghosh, "eMotive Wallpaper for Windows PC, Apple Mac, iPad, iPhone," in The Customize Windows, March 12, 2012, April 25, 2019, https://thecustomizewindows.com/2012/03/emotive-wallpaper-for-windows-pc-apple-mac-ipad-iphone/.